Tony Drockton is the founder of luxury handbag designer, Hammitt based on Los Angeles. Celebrating his 10 year anniversary his third business, we discussed his journey of success, lessons we can all learn from. One of his secrets of success is building business one relationship at a time. He's a firm believer, that especially for smaller businesses, it's all about relationships. 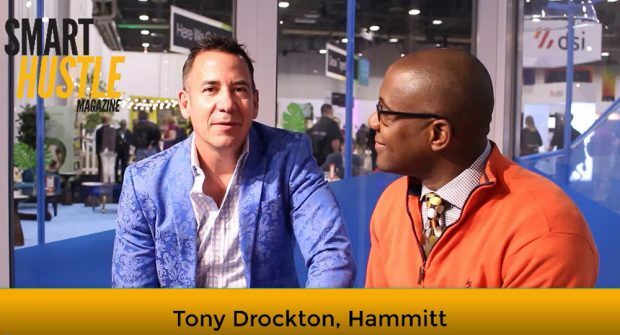 Getting to know and working with one retailer and a time, and doing this over the years, leads to lots of retailers who know and like working with the Hammitt brand, and Tony. Watch the interview and read the full blog post below. The power of building great relationships is that if you win one customer, then they'll refer more business to you. Tony cautions, however, in growing too fast. Having that 15 seconds of fame or getting too much money early on can kill your business. Daymond John speaks about this in his book, The Power of Broke. It's better to run your business as if you have no money or at least very little of it. In giving advice to the fashion industry Tony says that if your goal is to be trendy and a "quick hit wonder" you need to go big and you can't miss. However, if you want to be a long term brand, built to last, then you need to be patient. He says to build a core business model around the great customers you have and grow from there. Community building is very important to Tony. By building a community you're able to mentor and help others and others are able to help you, hold you accountable and be a mutual part of a successful growing business. As business owners, fashion or otherwise, we must know the TYPE we are and focus on the "block and tackle of business". Are we an entrepreneur that likes to get things started quickly? Do we like to plan more? Are we very analytical and etc. The block and tackle of business means knowing about cash flow, how to be a profitable business, marketing fundamentals and so much more. Tony's three "C"s of building a successful business are - Craftsmanship, customer and community! I asked Tony about how he uses technology in his business and he said that a mentor recommended Netsuite to him. Netsuite is what powers is website, enables him to sell from anywhere and even helps him ship his products. It's the backbone of Hammitt. Every growing business a tool that enables them to bring together their customers, sales, inventory, shipping, and more. You don't need to be a "nerd" or a geek to use technology in your business, but you should find someone who IS. If a sales person is selling you technology, but they don't know tech, be careful, Tony advises.